Maybe I need a new pair of glasses, but I cannot find any infos about the new vacuum pump on Miso's website; same for the price. As I've posted before, I think the Sentinel is terrific. I do struggle though with the idea of an electric pump. What's the point? It only takes a dozen or so pumps with the hand pump, it's not hard - and why add electric pumps and a battery? Just more potential things to go wrong. Or am I being an old geezer and missing something? Is it normal that with hand pump I need maybe 5-6 times to pump the housing? I read in manual that it should be something like 20 times. What will happen when the protective cap will got leak or I just forgot to install it ??? Is the red valve/membrane will keep vacuum/water sealing when it will got water pressure from outside?? How long this system can operate on one battery ?? I want to estimate how many batteries I need for 1 week trip with 3h diving per day. Never go diving without the protective cap. When ever you take out the pump, always put the protective cap before doing anything else to avoid to forget to put it. Miso advised new battery good for 100 hours. Thank You Pedro for detailed answer. Being paranoid, I always hold the protective cap in the palm of one hand when I remove the cap for any reason. It is marginally awkward to pump but it ensures that I replace the cap as soon as I am finished pressurizing the housing. They can roll away very easy. My backup for the Leak Sentinel electric pump is one spare 9V battery, after two years no problem. I have used the Leak Sentinel electric vacuum pump for about 3 years, and no longer carry a hand pump, just a spare 9 V battery. A spare cap for the Leak Sentinel is also an excellent idea. 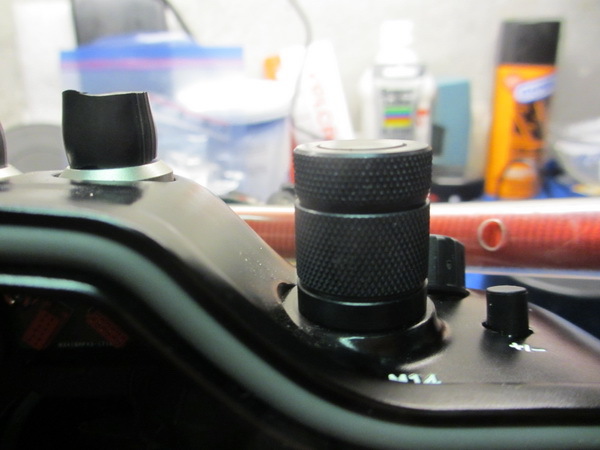 The Vivid Leak Sentinel V5 is now available in a shorty version, which fits nicely on my Nauticam NA500 housing, as does the standard size V5. One can close the housing and pump a vacuum the night before, turn off the Sentinel to save the battery, turn it on in the morning and be ready to dive without worry. 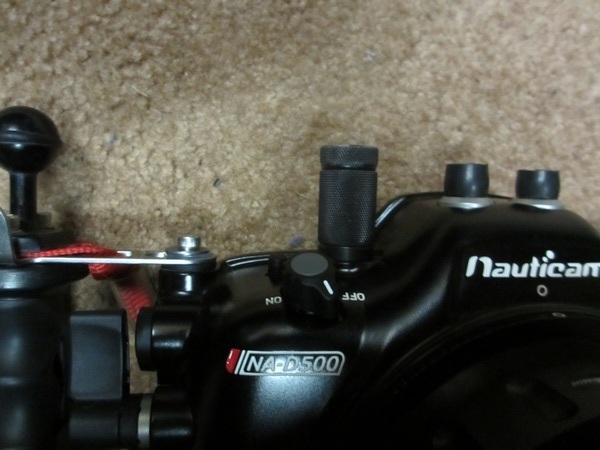 The Leak Sentinel can be used together with the built in Nauticam leak and vacuum detectors, or by itself. I find the Nauticam light to be too big and bright; it can be masked partially with plastic tape, or not turned on. The Vivid Sentinel Vacuuum Leak Detector, version 5, is available in two versions, one with a short and one with a long body. The short version has the battery in a separate unit lodged inside the housing, connected by a cord. It fits nicely on my Nauticam, next to the viewfinder. The long version houses the battery in the body tube. 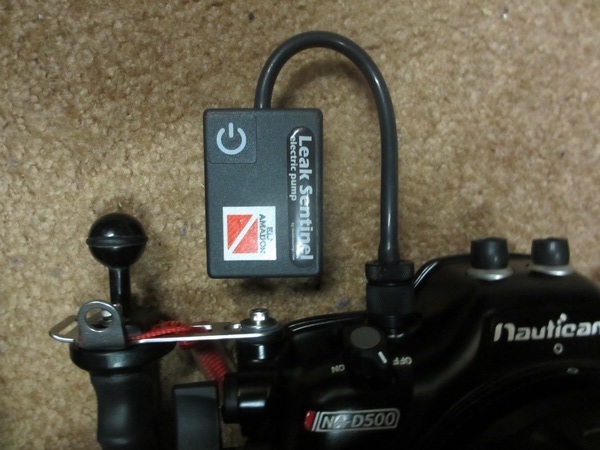 It also fits next to the viewfinder, where it is easy to monitor the vacuum status light. As Sperm Whale mentions above, an added advantage to the Sentinel Vac Leak detector is that at the end of the day one can prepare and close the housing, pump a vacuum, turn off the Sentinel to save the battery, and turn it on the next morning to check the vacuum. For the past two to three years I have used the electric Sentinel vacuum pump. A working vacuum takes about 20 to 30 seconds of pumping. For backup I carry a spare 9V battery and also a second cap for the leak detector. If the housing, such a Nauticam, has a built in vacuum detector, one can plug into it the Vivid Sentinel without the electronics or battery, just as a vacuum valve. For some divers a minor problem with this approach might be that the Nauticam's built in flashing light is a bit bright and distracting, while that of the Sentinel is subdued and less intrusive. And, should the battery of the vacuum detector die, the vacuum can still be tested by first pumping a vacuum and then, after some time passes, trying to open the housing by releasing a latch. If the vacuum is good, the housing will remain sealed, and one can go diving. Edited by Kraken de Mabini, 25 November 2018 - 10:51 AM. I did but no longer do I carry a hand pump as backup, just two 9V batteries. I watch the pump On time, keep it under one minute. No problems thus far.